My friend Karen Pessia, a talented applique artist, completed the quilt top which features the May Tulips design by Marie Webster. I used two layers of trapunto batting behind the applique shapes and feathers, a technique I learned in a class from Philippa Naylor. The white color of the trapunto batting contrasts with the cream colored wool batt used for the background. 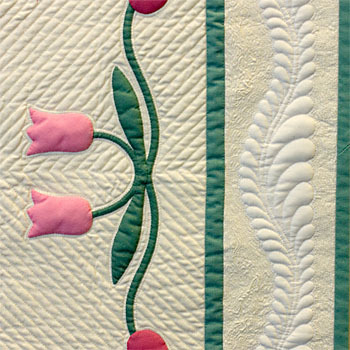 To make the feathers stand out more, I quilted the background with a soft yellow silk thread. 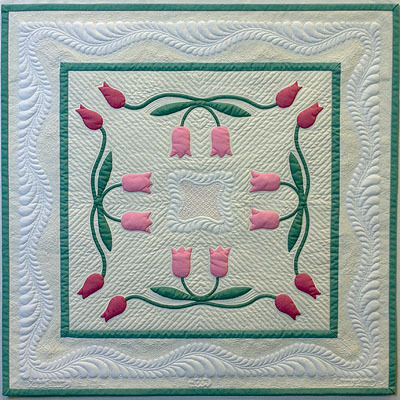 The one-block wall quilt was made for the silent auction at The Quilters Hall of Fame Triple Anniversary Celebration in July, 2009. For more information, scroll or click to the bottom of the page. The Quilters Hall of Fame is a National Historic Landmark that honors today’s quilt makers. 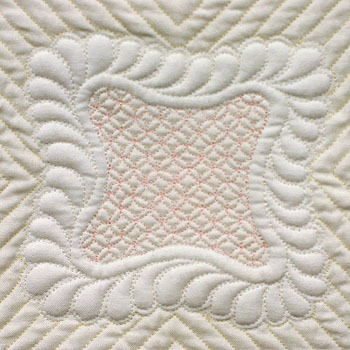 On July 16-19, 2009, The Quilters Hall of Fame celebrated the 150th birthday of Marie Webster, the 30th anniversary of The Quilters Hall of Fame, and the 5th anniversary of the opening of Marie Webster’s home in Marion, Indiana where she operated an early mail order quilt pattern business.